I have a plethora of shoes. That’s well established by this blog. But I want more. I am always looking for and wanting the next pair of shoes. Something even better. This gives me a bit of joy when I find a great pair. But my shoe wants also cause me problems (the Buddhist monks reading this are likely nodding their heads at this point). I don’t want to be that old guy who struggles to navigate his house because it is packed with shoe boxes. And has 12 semi-feral cats interspersed amongst them. And eats store brand ketchup as a meal. Because of this, I have a rule that I need to get rid of a pair of shoes to get a new pair (or an old pair (or a new old pair)). It’s an anti-hoarding measure and it is intended to keep me from this ketchup eating future. This hoarding rule causes me anxiety though. Which pair? Sometimes it’s obvious that a particular pair needs to be voted off my shoe island but often it is not. Then I struggle. Why do I find it hard part with a handsome pair that I haven’t worn in four years? All of this (the buying and selling), must be some sort of disorder. I likely need some kind of medicine but I haven’t seen a pharma TV commercial showing a happy family frolicking at the beach and promising a life free of packing boxes (while a background voice quickly describes ominous side effects). Until pharma finds my chemical cure, I have this blog. 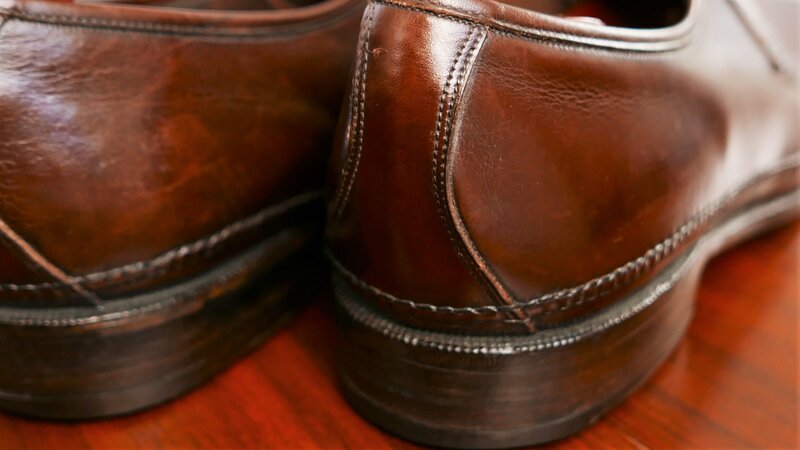 The shoes in this post are a rare pair of Florsheim Imperials. 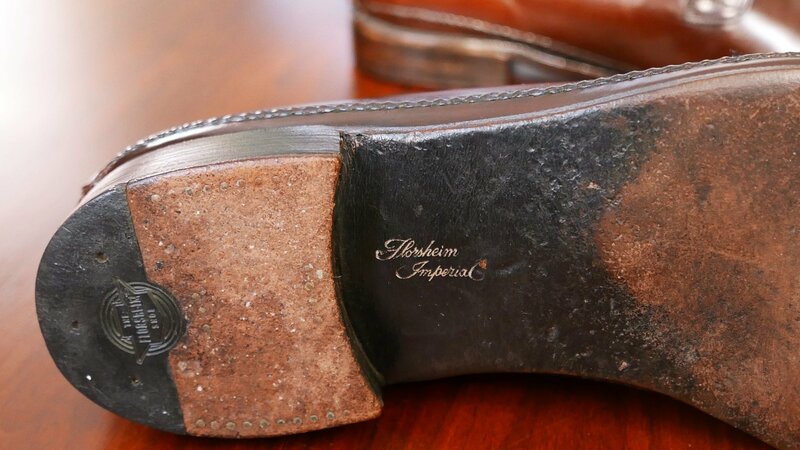 There are a number of rare Florsheim models but this pair is unusual because of the hand sewn band encircling the entire upper. The model was made for a year or two in the early 1960s. 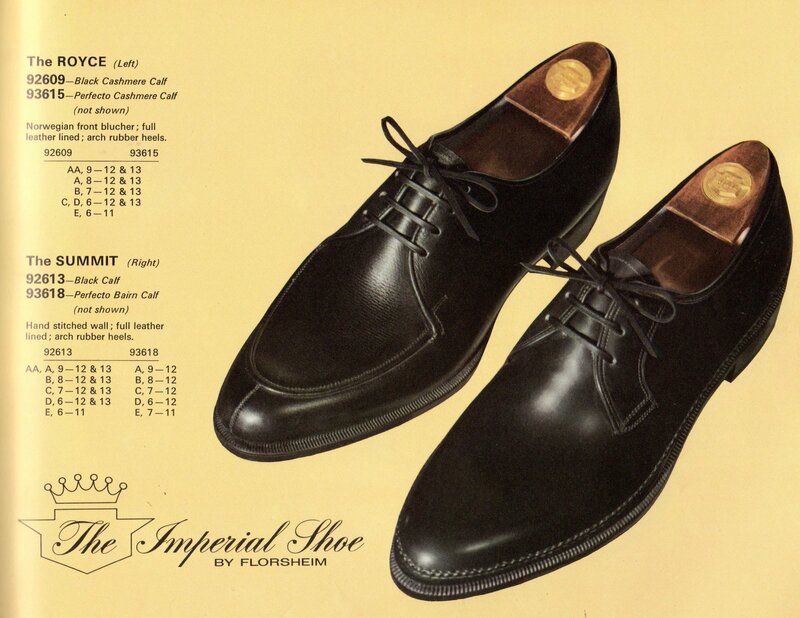 Below is a photo of the pair from a 1964 Florsheim catalog. The style is very 1960s – modern and lacking any broguing. Sort of a whole cut blucher but having the hand sewn seam. It must have been a time-consuming (expensive), pair to manufacture. This is the only pair I have seen online or in person. 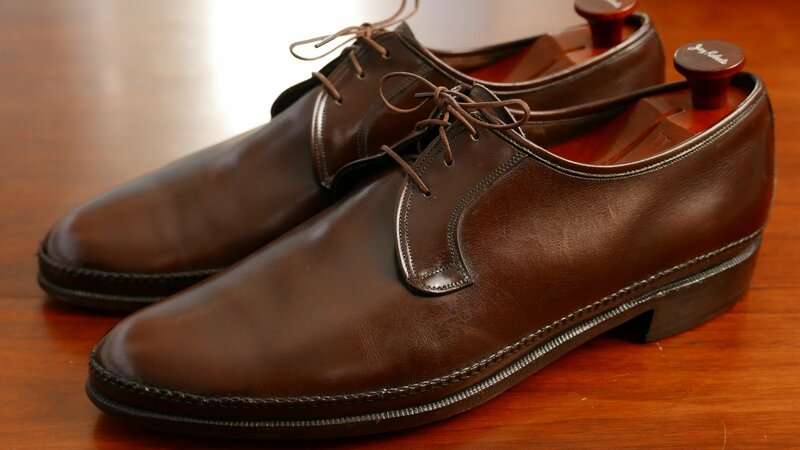 I acquired the pair from my favorite source of high end shoes – the Goodwill. If you like the pair, you can check your local Goodwill but am fairly certain they won’t have another pair. 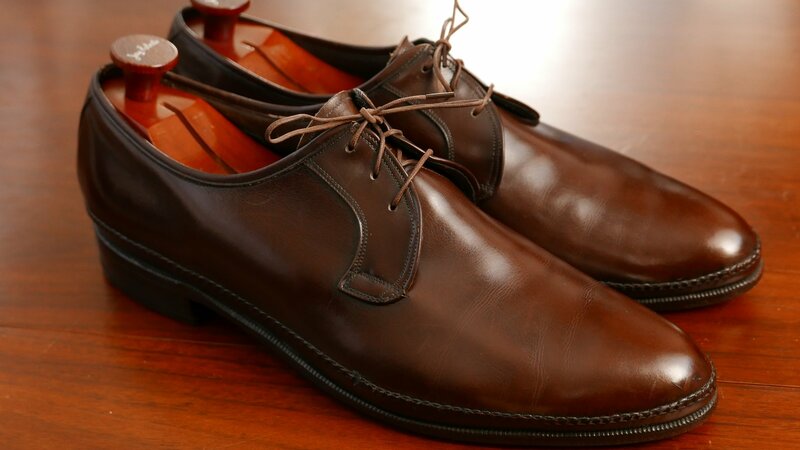 The pair was obviously not new but had its original sole and heel. 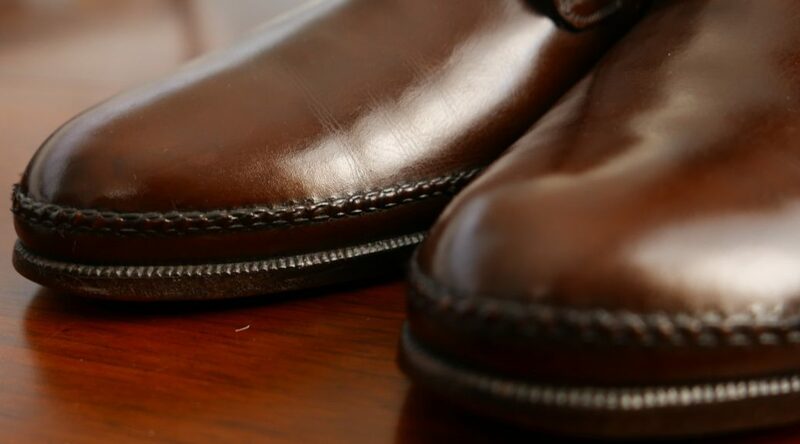 The sole is closed channel. 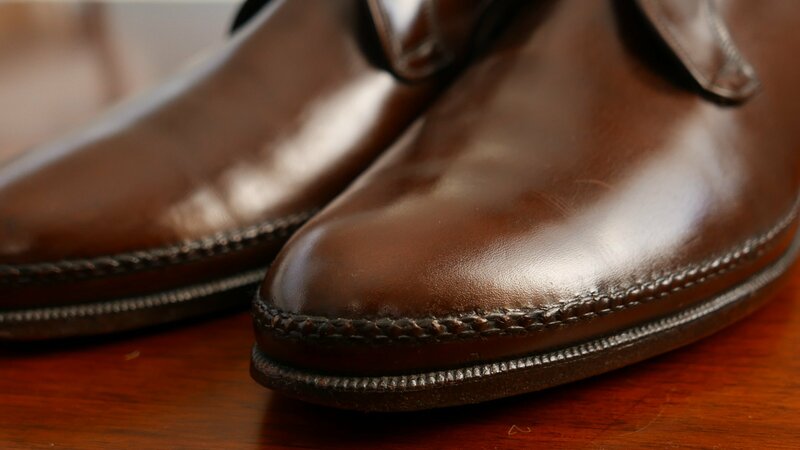 The pair doesn’t appear to be Goodyear welted. 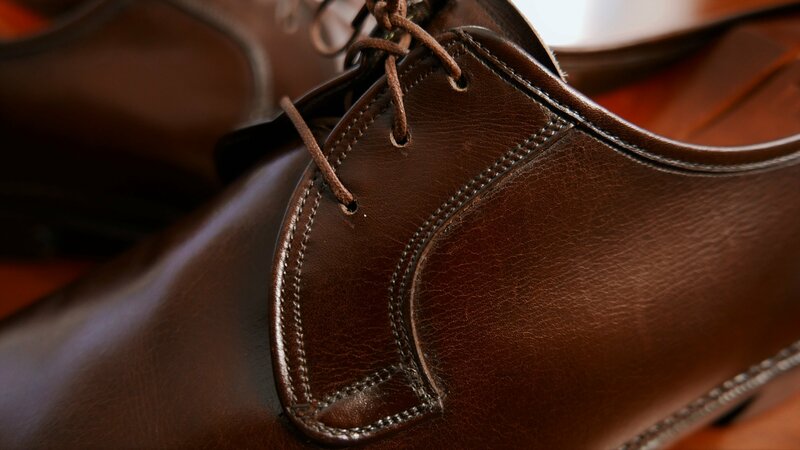 The style of rubber/leather heel toplift is known (at least I know), to not age well. The rubber tends to disintegrate when wearing. But I haven’t worn them since they are too small for me. 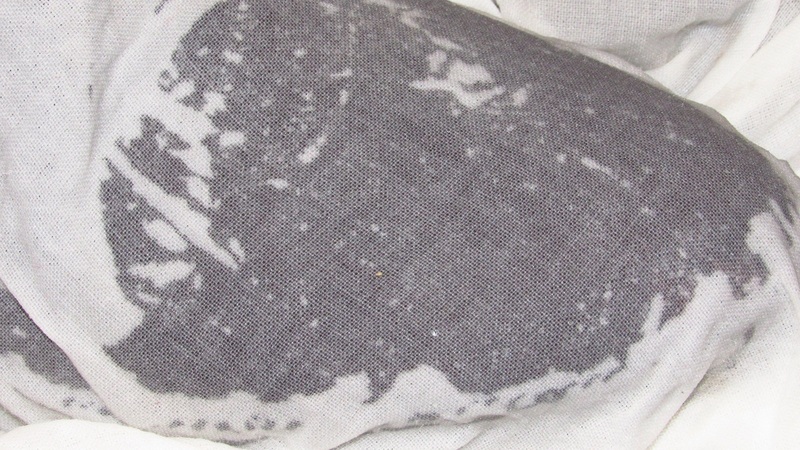 The leather is described in the catalog as “Bairn Calf”. It was a term I had not heard of and when I looked it up on Google, I found no results. Bairn apparently is a Scottish term for child. 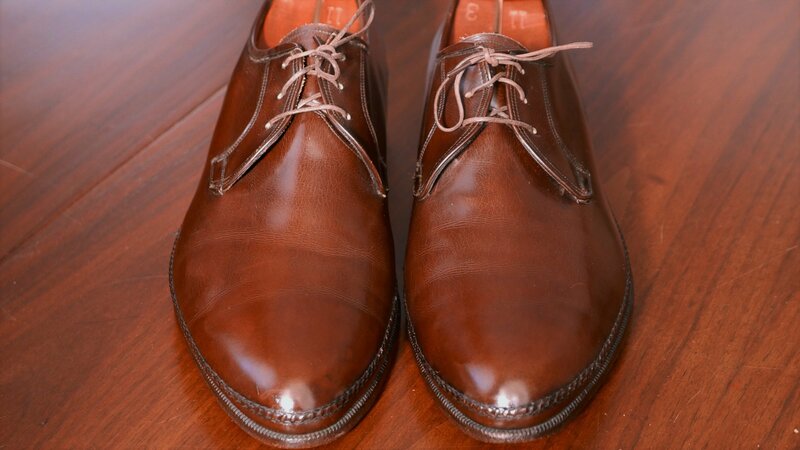 The upper leather was in fairly good condition. 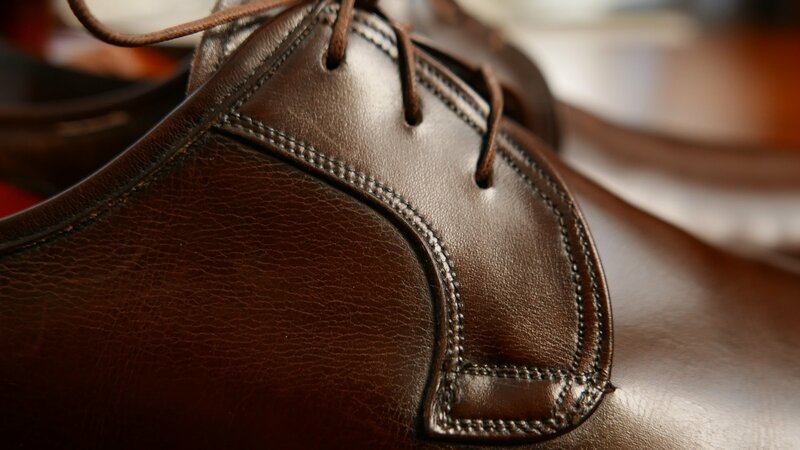 The leather was still soft and without any significant scuffs. It did have some patina from old polish. I decided to give the pair a glycerin conditioning treatment. I don’t frequently do this for my other shoes. Probably one in ten pair are treated with glycerin. The glycerin treatment helped but it doesn’t reverse the aging effects on leather. Conditioning will help arrest further decay though. I followed up the glycerin treatment with a round of Bick 4 and then applied dark brown Saphir Medaille d’Or Cream Polish. And of course, I Sonicare’d the welt and applied dark brown edge dressing. Below are some additional photos of the model. It will be in my collection until it is sold or I am cured. 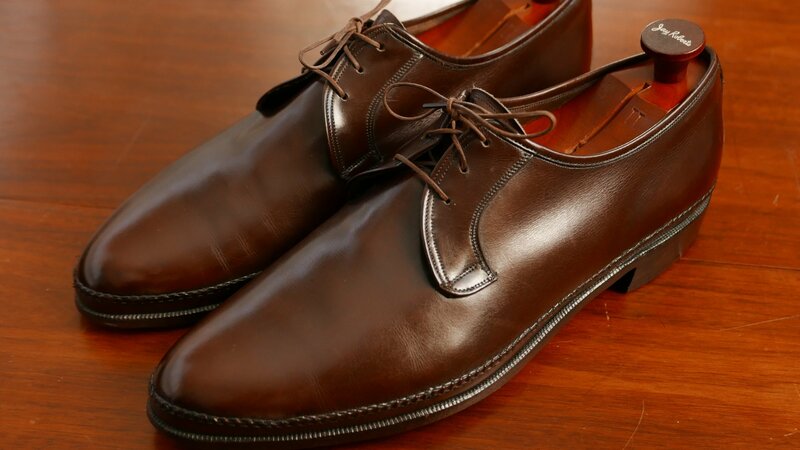 Too bad such shoes are not commonly encountered on Ebay. But even if they were, they do not come in eee. Sad face. *hoarding – sorry to nit-pick but a horde is a gathering, to hoard is to accumulate. Love the blog. I guess you do have a horde of shoes though! I want to shop at your Goodwill. 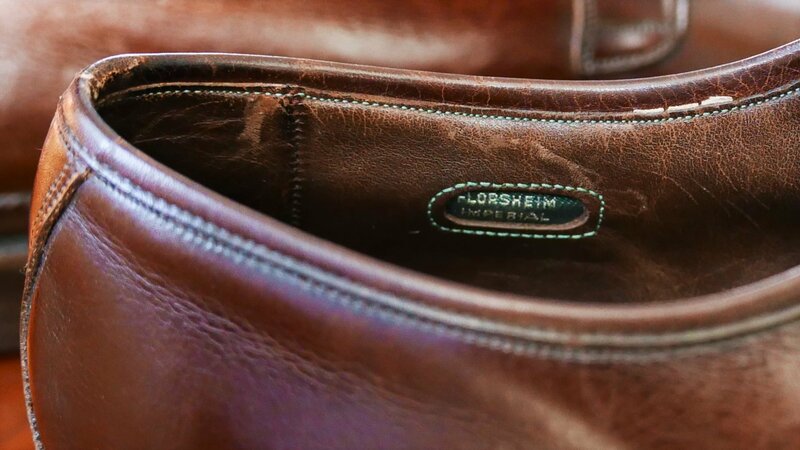 To find even a beaten-up, not-my-size, India-made pair of Florsheim longwings is a thrill at the thrifts I hit. I saw your ebay post. 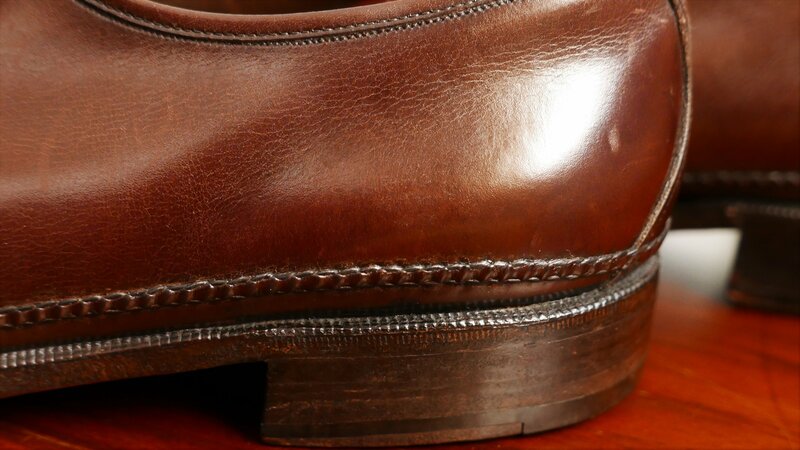 That is a Florsheim Imperial 93619 from 1970. I don’t know why the model number wasn’t listed in the shoe. Thank you David ! I can’t believe the weight of the shoes. There is another pair on eBay right now with the same hand-sewn banding but they’re calling them 1960s magic tops. I have a pair of Magic Top’s but without the banding. Very smooth black leather with a simple wing tip design. Perfectly fitting shoes. They fit like a glove on me.